To collect the apples needed for cider, my brother awoke me early on my first morning in town and drove me through a maze of foggy backroads and hayfields to a lone apple tree at the edge of an expansive rye grass pasture. This wasn't necessarily a secret tree, it grew ten feet from the side of a two-lane highway, but with the valley around us shrouded in fog it felt as if he had lead me to the sanctum sanctorum of apple trees. I asked him if it was legal for us to pick from this tree. He shrugged and without blinking an eye backed the truck under the tangle of branches. Getting out of the cab, he handed me a long-handled garden hoe. "You want to beat the branches with this," he said. I was confused at first, but the logic of the garden hoe was quickly apparent as I hit the branches. The tree had the appearance of a very large vine, and the apples were small and grew together in great clusters as would bunches of grapes. Each stroke with the garden hoe brought down a shower of fruit. Apples hit me several times in the face, one smashed me squarely in the mouth, and the dampness of the morning dew on the fruit soaked through my jacket and the front of my jeans as it descended around me. We filled the bed of the truck in fifteen minutes. When we returned from the foggy labyrinth of backroads and highways we set about the real work of cidering. 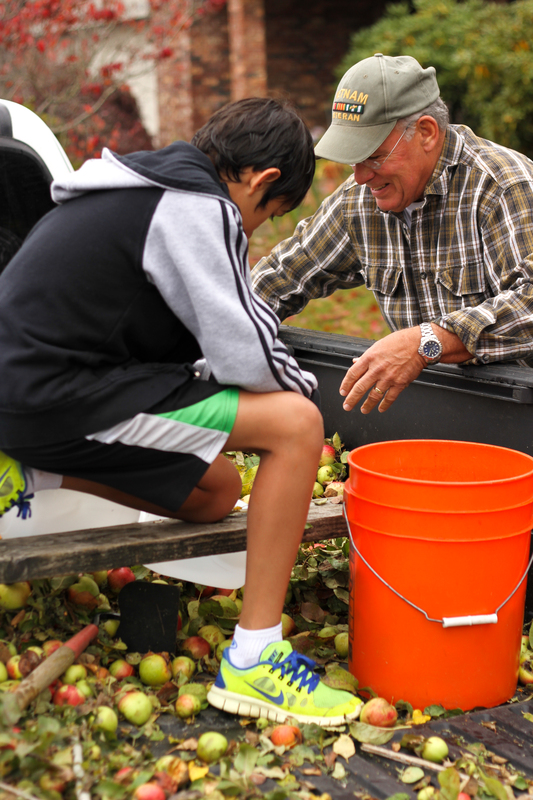 For my brother's family, the task of cider-making has become so mundane, so commonplace, that it is considered a chore. 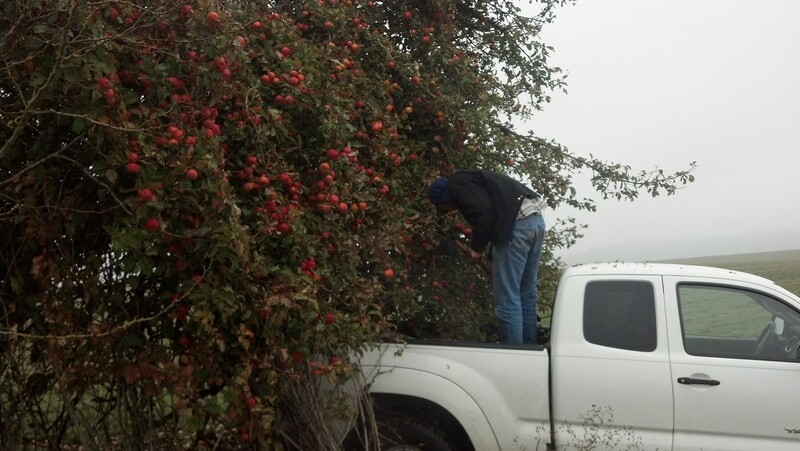 His youngest son bemoaned the work as he scooped apples from the truck bed and took them to be washed. 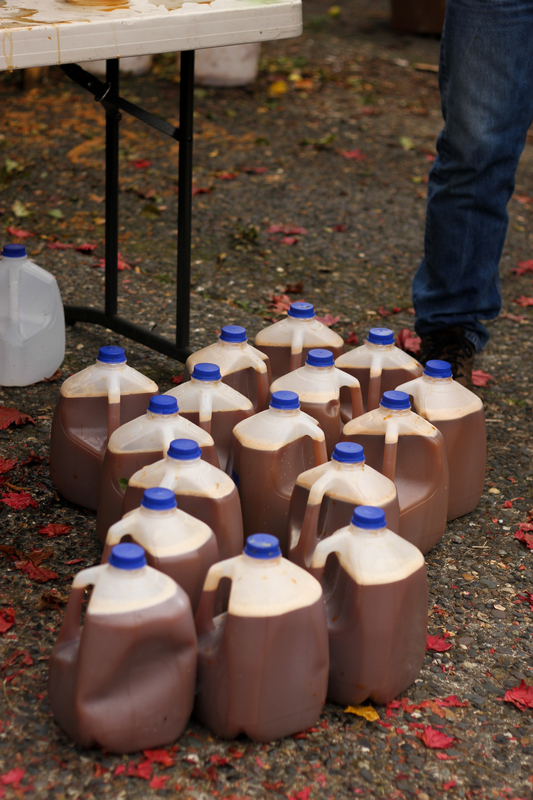 When your father insists on pressing sixty-five gallons of cider every year (one for each week plus thirteen for special occasions and to give away), the job must lose a bit of its magic. 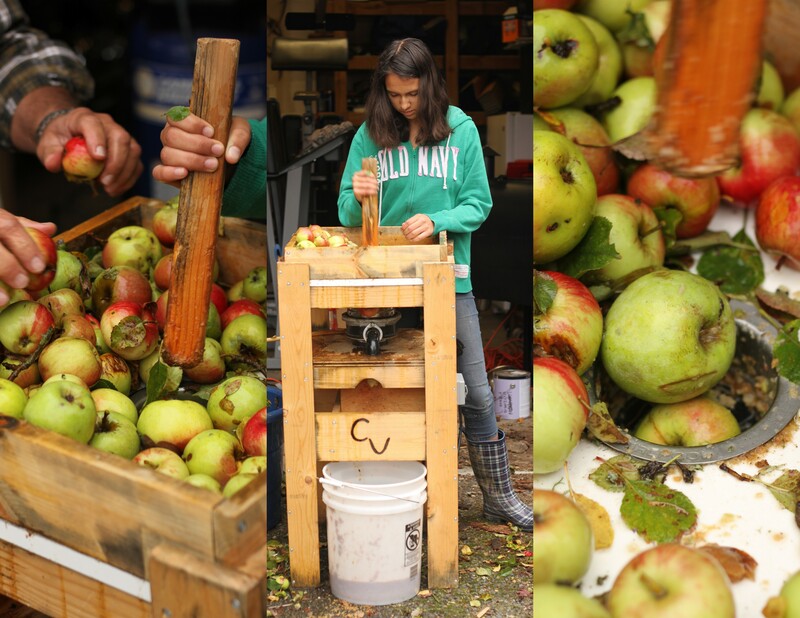 With the apples washed and sorted (bad spots were acceptable, wholly rotted fruit was thrown away), we prepared them for the grinder. 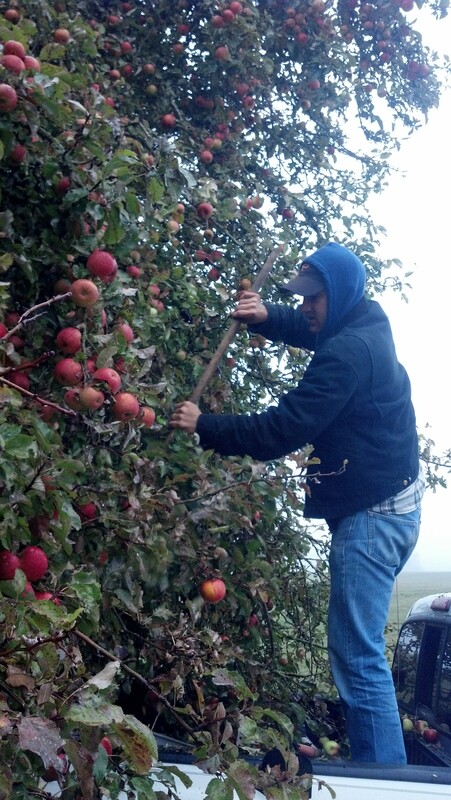 My brother does not core or peel his apples for his brand of cider. 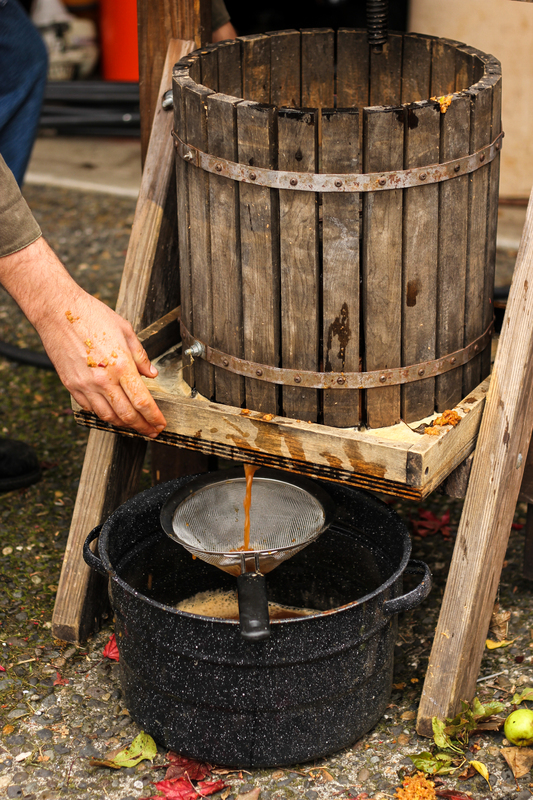 We did not check them for worms (much to the horror of our mother), and we allowed for small sticks and leaves to enter the mash, something I opposed, though my brother told me that in traditional cider recipes, the presser will often add sawdust to the mash to maximize juice output. The ground up sticks and leaves served us that purpose. 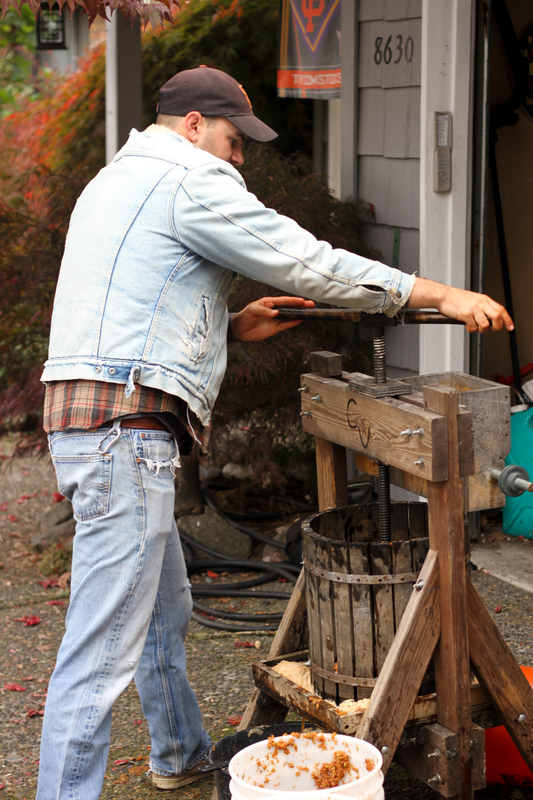 The masher itself is my brother's own invention and the product of many years of trial and error. 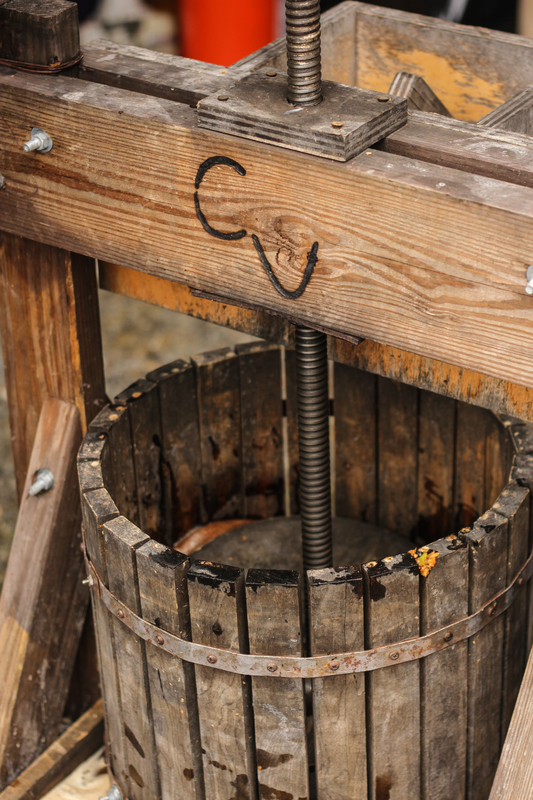 It is essentially a garbage disposal that has been rigged with a 1 horsepower farm-duty ag motor. The stock motor on the regular garbage disposals was too weak and overheated. 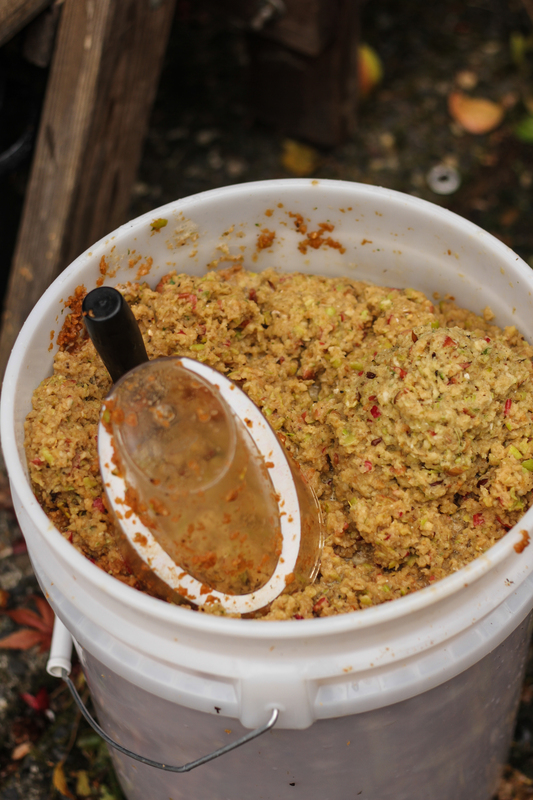 With the added power of the farm-duty motor the blades in the garbage disposal ate the apples easily and produced a thick mash that had the color and consistency of hearty oatmeal. As the mash sat in the open air and began to oxidize, it changed from its original oatmeal beige to a deep woody mahogany. 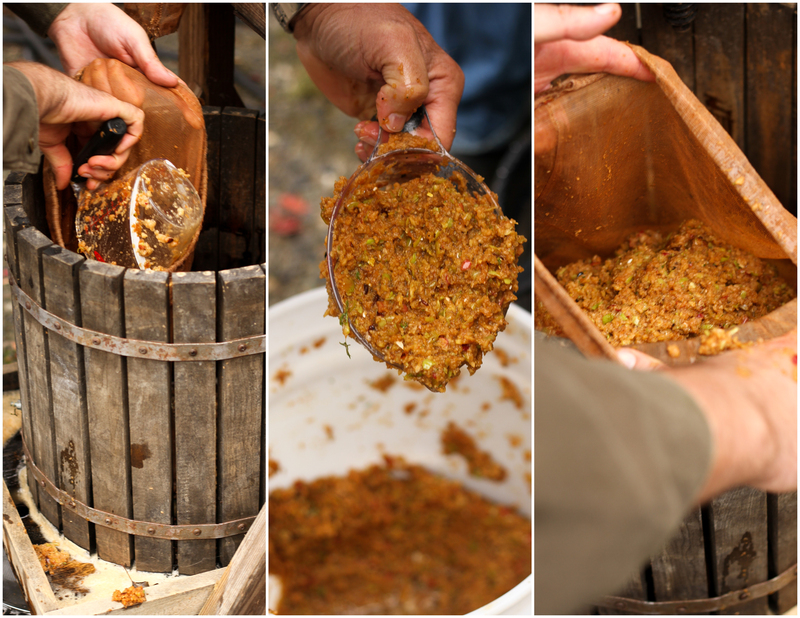 We readied the press and I sank my hands far down into the mash to scoop it into the press-basket. Soon the skin on my palms was stained with rich color--the color of autumn and earth. This is my brother's apple cider. He does not add water or spices, and yet there is always a hint of cinnamon and nutmeg in the drink. 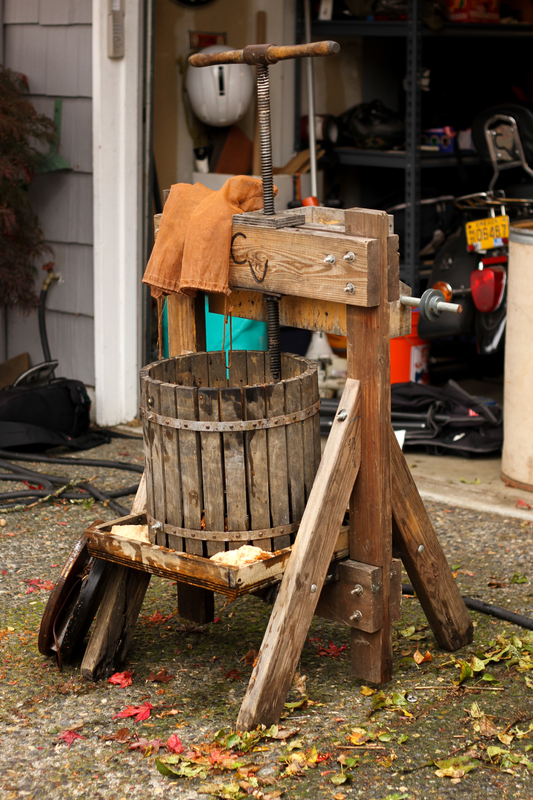 Each year's pressing will be unique, depending on the tree that gave the fruit and the variety of apples mixed in. This year we gathered the apples from a single tree, making the batch relatively uniform, though still delicious. 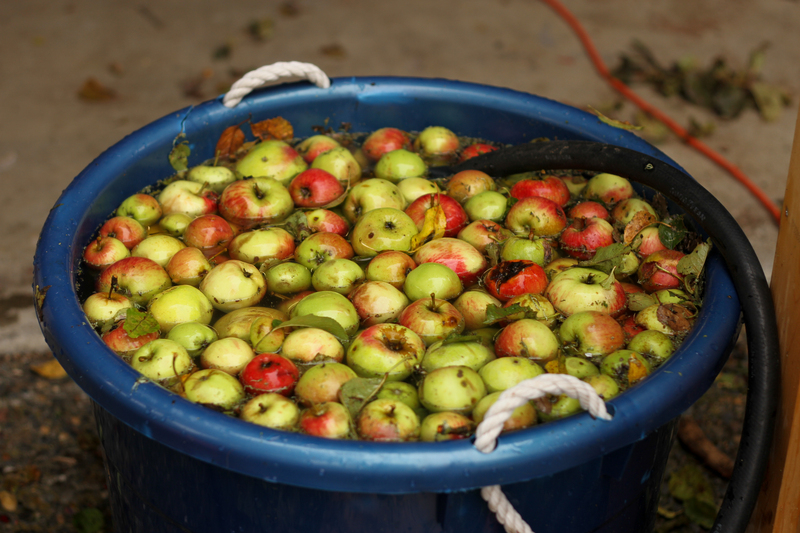 No matter what, the cider is always rich and always earthy, worms and leaves and all. All taken near Markleeville, CA. About 30 miles south of Lake Tahoe. On top of Monitor Pass. I love this place. I think that it's good to ascend from the heavy atmosphere of the lowlands into the cleanliness of high altitudes. The air is fresh on the wind and the whole place smells of sage and pine. This was John Muir's sanctuary and for the most part, I consider it mine as well. In the granite above Grover Hot Springs. At Monitor Pass looking towards Gardnerville/Minden. Looking around in the rocks I found an animal skull under a Pinion pine. I think it was a coyote skull, but it's teeth were bigger than any coyote teeth I've ever seen. Maybe they just grow them bigger up there on the pass. Campground at night. Wind made the treetops blurry and cloud cover spoiled any hope for stars. Progressing sunrise with ground fog in Middletown. Between 7:00 and 7:30am. About 8:30am the fog began to burn off. There is a little carpet of green grass shooting up from the big storm that passed through last week, which is pretty common for Northern California. The winters aren't cold enough for snow, so the grass sprouts now and grows through the winter until spring. 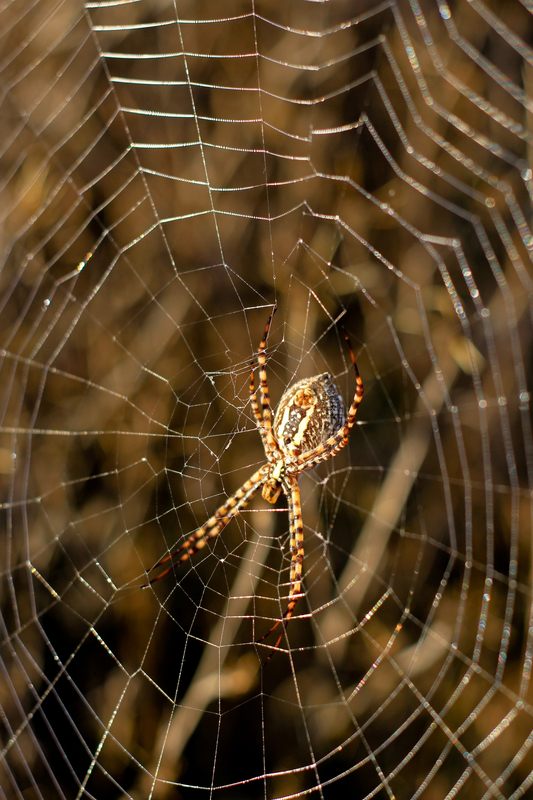 I found this spider soaking in the sunlight from the middle of it's dew drenched web that it built in the star thistle. It's a Banded Argiope spider. I looked it up after I got home. This one was probably a female judging by the size. 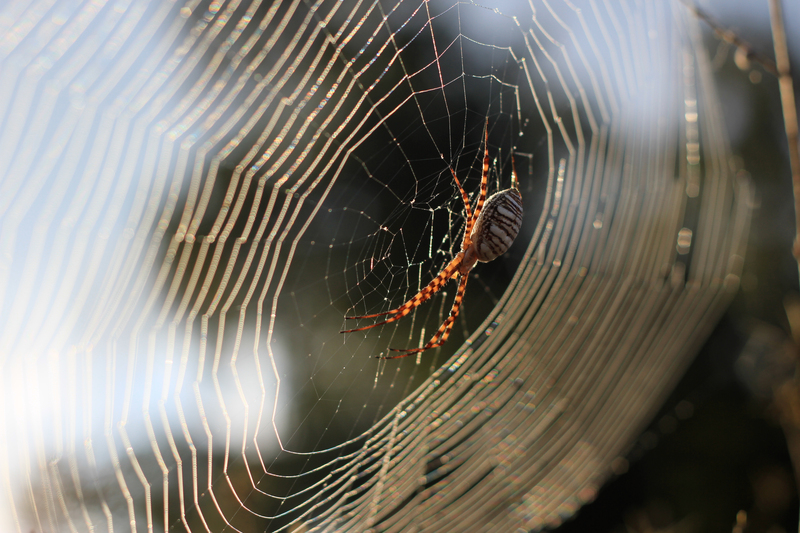 Males of the species tend to be smaller and build their webs as appendages to the female web rather than on their own. This one was several inches long and about as plump as a small robin egg. 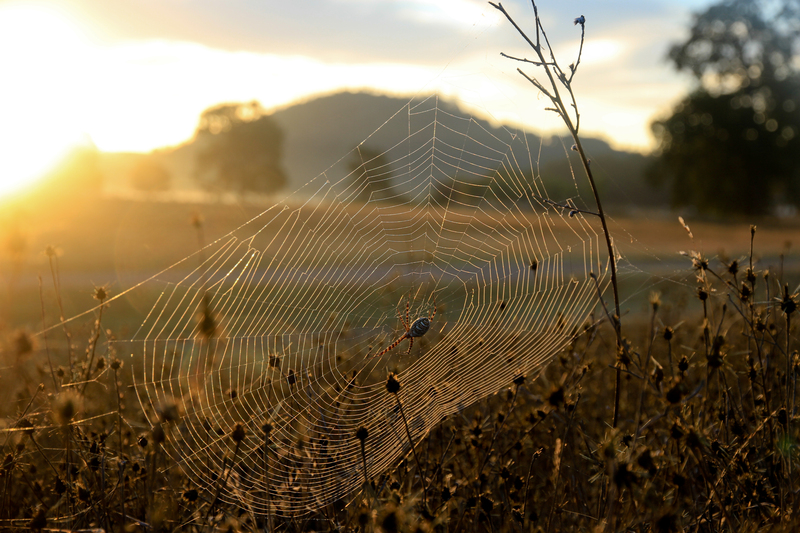 As I was shooting, the morning light caught the little droplets of dew and made a rainbow in the web. I don't care much for spiders. 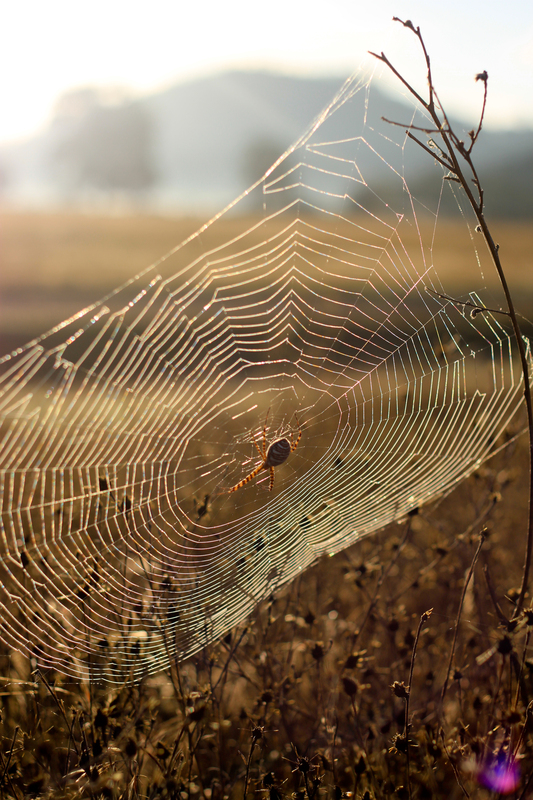 They kind of freak me out, though I don't mind them out in the fields, and I think their webs are cool. I just don't want one this big in my house. Luckily the Banded Argiope is a garden spider and generally doesn't come inside.